Royal Wedding follows Princess Mia and her Prince Charming as they plan their fairy tale wedding - but a few poisoned apples could turn this happily-ever-after into a royal nightmare. For Princess Mia, the past five years since college graduation have been a whirlwind of activity, what with living in New York City, running her new teen community centre, being madly in love, and attending royal engagements. And speaking of engagements, Mia's gorgeous longtime boyfriend Michael managed to clear both their schedules just long enough for an exotic (and very private) Caribbean island interlude where he popped the question! Of course Mia didn't need to consult her diary to know that her answer was a royal oui. But now Mia has a scandal of majestic proportions to contend with: Her grandmother's leaked 'fake' wedding plans to the press that could cause even normally calm Michael to become a runaway groom. Worse, a scheming politico is trying to force Mia's father from the throne, all because of a royal secret that could leave Genovia without a monarch. 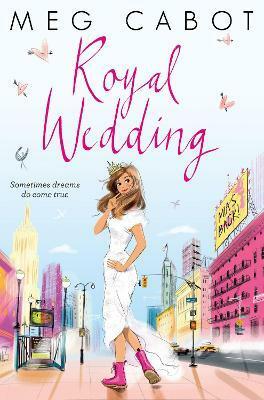 Can Mia prove to everyone - especially herself - that she's not only ready to wed, but ready to rule as well? Original fans of the series, now adults themselves, will be thrilled with this, but it will be enjoyable for those on either side of Cabot's extensive fan base. At any rate, it won't stay on shelves for long, so stock up. * Booklist * The reveals, even pacing, breezy tone, and of course, flamboyant royal wedding will engage fans and charm new readers.This standout in the genre is for lovers of fairy tale-like romance, fans of the series, and chick-lit readers. * Library Journal * Cabot charms in the latest installation of her Princess Diaries series, the 11th book and the first geared to adults. Lovably neurotic Princess Mia Thermopolis of Genovia has plenty on her plate-dodging the paparazzi and online stalkers, dealing with insulting bloggers, and, of course, attending to her royal duties-when her life turns to absolute chaos. After Mia's longtime love, Michael Moscovitz, pops the question on a romantic beach getaway, Mia thinks a happy ending is all but assured. She doesn't count on her quirky father's antics, meeting a close relative for the first time, and a shocking surprise in the family department, one that is destined to change the course of Mia's life. The Princess Diaries series continues to be phenomenally successful many years since its first publication. After topping the US and UK bestseller lists for weeks and winning several awards, Meg Cabot was crowned the 'reigning grande dame of teenage chick lit' by The New York Times Book Review. Two films produced by Disney based on the series have been hugely popular throughout the world. Meg Cabot has written many books for children, teenagers and adults, including the bestselling Abandon series, the All-American Girl books, Teen Idol, Avalon High, How to Be Popular and The Mediator series. Meg Cabot (her last name rhymes with habit, as in 'her books can be habit-forming') currently lives in Key West, Florida, with her husband and two cats.